The free font of the week is not stored on your account for future downloads and is only available to download during the promotion. For a limited time, you can download Stringlight Typeface with a premium license for free. 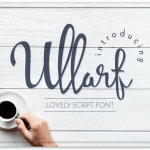 You can use this Monoline Script Typeface on unlimited projects for yourself, family members, and friends. Stringlight Typeface is a complete font set that includes lower and upper case letters, assorted punctuation, numbers, swash, and multilingual support. This Monoline Script Typeface font by Riverside Digital Type Foundry also contains several ligatures and contextual alternates for lower case characters, accessible in the Adobe Illustrator Glyphs panel, or under Stylistic Alternates in the Adobe Photoshop OpenType menu.